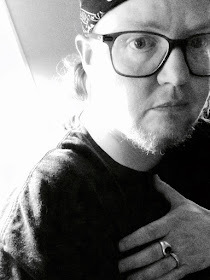 Jay Besemer’s books and chapbooks include The Ways of the Monster (forthcoming, *KIN(D)/The Operating System 2018), Crybaby City (Spuyten Duyvil), Telephone, Chelate (both Brooklyn Arts Press), and Aster to Daylily (Damask Press). He was a finalist for the 2017 Publishing Triangle Award for Trans and Gender-Variant Literature. He tweets frequently @divinetailor and sometimes does things on Tumblr http://jaybesemer.tumblr.com. This question makes me laugh, because my first book was such an anticlimax and at the same time a generator of such ambivalence, in myself and (weirdly) in others. Some of that has to do with my age: I was 43 when my first book was published, though I’d been in mags and journals for about 25 years by that time. I had shed a lot of my fantasy notions about what a book would do. That’s not to say it isn’t/wasn’t important to me. More than changing my life, I think TELEPHONE coincided with a period of intense change that began with its publication and is still hotly ongoing five years later. There’s a chronological assumption that people make—mostly non-writers, but some writers too—that books are published consecutively in the order they were written. Because of the way I work, that would never be possible for me, but even people who work more traditionally don’t experience their publications in that order. For me, the order of the books’ publication has obscured their relationship in ways that are probably pretty fertile. Telephone is actually the first in a trilogy formed with Chelate (my third) and The Ways of the Monster (forthcoming in December 2018) and drafted more or less in sequence. But the intervening two—A New Territory Sought and Crybaby City—were erasure/cut up projects that were both begun somewhere in 2009-10. Crybaby took seven years to finalize and place, and in fact its final version was determined by some of the practicalities of the production process. I once joked, with my editor/friend Joe Pan, that all my books are the same single huge book, done differently and published as a loose “serial.” I think I was adapting a quote from George Bataille. Anyway, all my work has certain throughlines that I will touch on in other answers. I use different methods and structural choices to make them happen, but they’re all obviously mine. I didn’t come to poetry first. Or maybe I don’t understand the question. I stared writing fiction and non-fiction before poetry. Very little of my fiction has been or is likely to be published, and the non-fiction is moving into a different mode, which will not see publication for a while. If you mean, why did I emphasize poetry or why is poetry the main thing I do now, I’ll quote my convenient tweet: I'm a poet because poetry is the only vehicle that allows me to simultaneously occupy all possible dimensions. 3 - How long does it take to start any particular writing project? Does your writing initially come quickly, or is it a slow process? Do first drafts appear looking close to their final shape, or does your work come out of copious notes? & 4 - Where does a poem usually begin for you? Are you an author of short pieces that end up combining into a larger project, or are you working on a "book" from the very beginning? I don’t have a way to generalize about temporality with my work, for two reasons. The first is that each project is very different and works according to its own sequence, its own temporality. The second is that I myself operate on a temporality that’s quite different from other people’s. This, combined with my working process (having multiple projects in varying media/disciplines) makes it impossible to put a sequential start-stop chronology on projects. Some things are offshoots of other things that then become more fully formed as their own project, while the original also continues. I’m always-beginning, always-continuing, sometimes-finishing. (Not everything gets finished; not everything published is something I see as “finished”). Also, some of my work is sourced (cut-up, collaged or erasure work) so that has its own temporality, its own duration, its own physical limits in terms of length, start-stop (an erasure work tends to be self-contained, not starting before the source text starts, not continuing after the end of the source text). Regarding “bookness,” combined shorter texts, etc., it is safe to say that all of those fit! I’ve done it all those ways. It’s mostly determined by the projects themselves how it tends to go. My last in-person reading was at Woodland Pattern in Milwaukee. I passed around the notebook in which I have been drafting the poems I read aloud (I’m still working on that project). I like de-mystifying my various working processes, but not all of them begin in a notebook. That green notebook containing what’s become The Horse shows how little revision a non-sourced project of mine tends to undergo. The ones that draw on source texts can have a lot more iterations and a lot more complexity in the revisions. You’re asking this at a time when my relationship and approach to public readings is changing drastically to reflect changes in my capacities and needs. So my response is not fixed in space-time, exactly. Historically, I’ve always enjoyed reading/performing in public, and attending others’ readings/performances. Both things have been vital to my sense of connection with a community and in discovering my audience (or that I have one at all!). But I have never been able to “tour” and lately I am not able to even (physically) attend more than two or three local performances/readings a year, much less perform myself. This has everything to do with my own needs as a disabled writer, both as an audience member and as a performer. These needs are complex and often mutually-contradictory, and no matter what I do I’m pretty much guaranteed to have to sacrifice some form of bodily safety in order to be physically present at an event. This isn’t acceptable, so I’m far less physically involved than I was. These days, I’m emphasizing remote participation using adaptive tech like videochat services (Skype etc. ), which often involves having to argue for this as a legit form of disability accommodation. This takes valuable energy, so I’m overall very choosy about what invitations I’ll accept—“acceptance” meaning “send my list of accommodations needs with an affirmative contingent on their meeting those needs.” I don’t try to secure gigs for myself any more, for the most part. I don’t have the energy. Another change in my approach to performance involves moving away from more traditional readings. Because a traditional 15-20 minute in-person reading slot can be too much for me, I’ve been trying to find ways to either mix this with a video projection or have the video be the performance. This is actually great for developing stronger video works, and for getting more of the videos out there. But there’s a downside to that as well. Everything takes energy, everything takes time and not every space or curator can accommodate that kind of work. I’m also often unable to produce work that fulfills my own commitment to offer poetic experiences inclusive of those with other kinds of disabilities, so I have to live with the disappointment of falling short there. Many. I am deeply engaged with queer theory, affect theory, various “crip” theories, theories of failure and precarity. I’m deeply involved with language as a mode of shaping reality, from thoughts to policy to bodies and built environments. I’m queer, trans, disabled. All of those things inform my writing, but I think it’s more accurate to say that I write from/through those embodiments, and the theories arising from and around them, than to say that I write “about” anything. I feel a writer’s purpose or role is to change, learn, grow, same as everyone else’s purpose. Maybe a writer has to do that more, though. Also, I believe that, like a doctor, the writer should do no harm. That’s not to say writers should not expose, criticize, take action, resist autocratic regimes, etc. We can and should. But I am anti-violence, and my commitment to nonviolence extends to language. I am unable to get behind any writer who harms others in their personal life, for any reason, or who behaves abusively (or even just badly) and calls it “political.” I live my life from the awareness that we are accountable to one another, all over the world, and to the planet. I think other writers can and might commit to this too—but I honestly don’t have the right to choose for others what that looks like or how it should go. I’ve had some truly wonderful experiences with editors, some just okay, some really bad. It’s like any other working collaboration/potential friendship; you show up to the process hoping to be as professional as you can as you try to meet what you hope are shared goals. I know any editor is going to be as goofy as I am; people are people. What helps us both is being clear about goals and expectations from the start. Also, because of the flowing and change-reliant nature of my working process, I’m generally very open to editorial input. Another person can give me deep insight into how something’s working that I wouldn’t get independently, so that is really important. There are very few things in any given project that are non-negotiable, but I do stand by those, and once or twice (in a writing/publishing career of nearly 30 years) they’ve been dealbreakers. “Separate your hazards.” I learned that in driver ed. 10 - How easy has it been for you to move between genres (poetry to performance to video poems to critical prose)? What do you see as the appeal? I can’t talk in terms of ease of movement or appeal in doing so, because it’s like asking my blood how easy it is to move through my body, or why it wants to do that. But I can speak to the moment of choice of medium. I experience it much like a food craving or a physical need. Sometimes it’s fairly general (“hmm. pizza.”) and sometimes very specific (“Bocce Club pizza with double cheese, sausage and pepperoni”). I guess the general is like a desire to have a certain type of experience (start a new video) and the specific is more a desire to have a more defined experience (go deep into this book and write a critical essay about it because there’s something I need that this deep engagement will give me). Take morning meds, feed cat, coffee, check twitter and email, plant care, probably some journaling. Mostly nothing gets worked on formally until after I’ve had enough coffee for whatever needs to get attention that day to present itself. I call it “listening” for the priority project, but it’s just paying attention to what my work needs most. If nothing presents itself I can choose not to work, or just to work on whatever. If I’m too symptomatic or in too much pain to work then I will read or watch stuff. I don’t stall as much as recognize the need to rest, or the natural ebbs and flows of various projects. Everything I do needs phases of taking in, phases of processing material, and phases of making. They’re not linear or sequential, though! I’m comfortable with this and recognize where I am in these larger processes, as well as where each project tends to be. Also, because of the realities of my various illnesses and the unpredictable levels of pain and fatigue I deal with throughout each day, I recognize that bodily realities/needs have a greater priority for my work cycles than anything else does. There are sometimes lengths of time when I can’t work, but this isn’t stalling. It’s the way my body works. Having multiple projects ongoing (“open”) also means that sometimes I have energy for one project or type of project when I can’t muster energy for other types. Buffalo: road tar, radiators & wool, cool concrete & books inside Brutalist college library buildings, snow. My father’s old place(s): summer hay, peonies, wood smoke, pipe tobacco, tomato vines, dirt, pine pitch. Where my mother lives, on the shore of Lake Erie: mildew, “that lake smell”, concord grapes, oak leaves, grass, dust. My own home: finished wood, books, sawdust, coffee, brown-fried onions, chopped garlic-ginger-green chiles, turmeric, coriander, plaster, linseed oil, nag champa. Yes, many. Architecture, film, several sciences, acting, experiences in built and not-built environments (i.e. “nature”), photography and the other visual arts I also practice, even stuff like cooking, gardening, landscape work, construction and farming. Skydiving. Not that it will happen! 17 - If you could pick any other occupation to attempt, what would it be? Or, alternately, what do you think you would have ended up doing had you not been a writer? & 18 - What made you write, as opposed to doing something else? I write because I need to write; it’s the sine qua non. I can’t not write. But if I could have continued to act (which I began to do in early childhood but could not continue) I would like to have done that. I know many (& of many more) actor-writers. I’m a re-reader and re-watcher, so I’m going to limit my answers to recent one-time (pre-re) reads/viewings. Two recent great books: Jackie Wang’s Carceral Capitalism and Anne Boyer’s A Handbook of Disappointed Fate. Film: Network.